The Mongolian naadam festival is an annual sporting carnival which runs over a few days. It takes place in towns throughout Mongolia, at various times from about 10 July through to the beginning of August. Watching a bunch of riders coming in over the wide, open steppe is one of the great sites of the Mongolian naadam festival. It starts as a cloud of dust some ten miles away, then you can pick out the black specs of riders which become larger and larger. The crowd starts ululating as they come in, and you know you're seeing something special. When they're at the finish line you're amazed to see they're all boys under 10 years old, with eagle feathers and blue rags tied to their horses for good luck. Many don't even have saddles! It's an amazing display of horsemanship, and highly recommended. A young boy is congratulated after the race, Olgii. All the Mongolian naadam festival riders are about his age. At a small countryside Naadam in the Tavan Bogd National Park. There were about a thousand riders spread out across the beautiful valley, all riding up towards the finish line in preparation for the horse race. Except for the modern clothing and the odd jeep driving past, one could almost imagine these same people riding under the Khans 700 years ago. Riding among that group was one of my favorite experiences in Mongolia. With young Mongolians regularly seen wrestling out in the streets and in the countryside, visitors will quickly realise that it's a big part of life and entertainment in Mongolia. In fact, even flirting couples seem to push eachother around a bit, a tactic which probably wouldn't quite work so well in your home country. 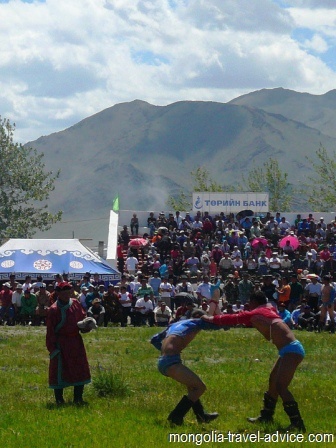 Wrestling at the Mongolian naadam festival is usually a knock-out tournament ran over a day or two. There's a big arena which can involve multiple fighters tussling simultaneously. Wrestlers come out in special leather boots with an upward toe, which looks pretty cool, and don't wear much else other than some strenthened underwear to hide the vitals and provide something for the opponent to grip onto. As the contender comes out, he performs an 'eagle dance' for good luck, then fights. First to be on his back loses, and the victor does a spinning eagle dance around the flagpole. In Ulan Bator the wrestlers are all huge, but in the countryside naadam every young man and soldier around seems to get thrown in. Tourists, too, can be encouraged to join! Towards the end of the tournament, only the top wrestlers remain, and it makes great viewing. You will also get some fantastic photos! 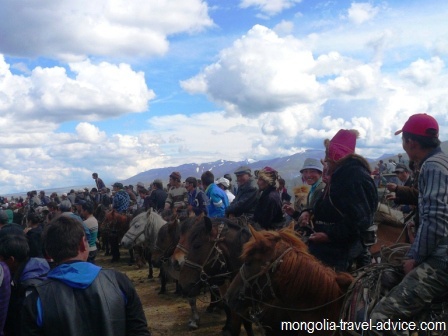 Naadam festival Mongolia: The beauty of the countryside Nadaam is that spectators can get a lot closer to the action. Hell, you don't even have to dismount! 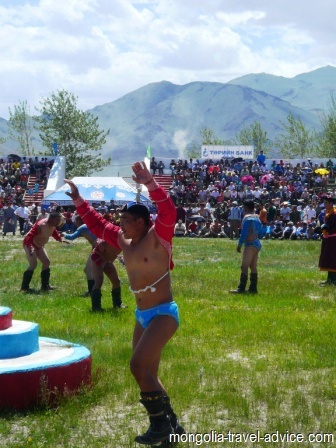 Wrestlers at the Mongolian naadam festival in Olgii. My pocket camera doesn't do the scene justice. The Mongolian nadaam festival is one time when it really pays to take a good camera. If you want photos better than mine, taken from my Lumix pocket camera, take a good SLR camera with a decent lens. Naadam festival Mongolia; the eagle dance: a wrestler raises his hands and spins around the flagpole in victory, after literally giving his vanquished foe a slap on the back. Note the traditional boots. The armies of Ghenghis Khan were famous for their skill as archers, with their compounded bows outperforming the English longbow. It's a good competition to see, and an important part of Mongolia's history. However, while every young Mongolian learns wrestling and horseriding, not so many learn archery anymore. Some Mongolian countryside naadam don't even include it. 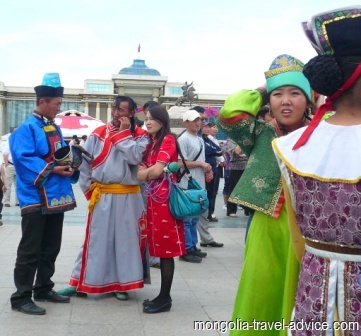 Naadam festival Mongolia: locals wearing traditional clothing from their regions chat and perform interviews with journalists after putting on a free display in Ulan Bator. As well as being a sports competition, the Mongolian naadam festival features a number of displays of traditional song, dance, and costumes that provide a great insight into Mongolian culture. You will get to hear Mongolian throat singing, a traditional method that sounds amazing. How to describe it? Um, imagine the sound a giant toad would make if it was being slowly squashed at varying rates of pressure. You'll also get to hear the traditional horse head fiddle, or Morin Khuur, it's something of a national symbol, and many describe it's noise as the sound of Mongolia . Literally, a fiddle with a horse head carved into the scroll at the top, the two strings are made of twisted horse tail hairs. A few of these together really makes for a hauntingly beautiful sound, it's quite a treat to hear them. There will be traditional dance at the Mongolian naadam festival, which is quite light and flowing. It's quite sweet, if not a little incongruent with the rest of the tough Mongol culture, to see men of warrior stock prancing around in something similar to ballet. There is a lot of traditional Mongolian clothing on display. Each ethnic group in Mongolia (I think there are 20-30, from memory) have their own distinct men's and women's clothing, which varies between the seasons and between commoners and noblemen (from the pre-communist days, of course). The silk robes look fantastic, and are popular for photographs. As a tourist, please don't go shoving your camera in peoples faces like they're some kind of zoo animal. The amount of times I've been embarrassed seeing westerners do this!! Please have some respect, and ask permission first. One of the main highlights of the Mongolian naadam festival for me is watching the Mongolian people enjoy the festival. There they are buying trinkets, lining up at cooking and food stalls, and posing for photos in front of cheesy artificial backdrops; it's just fun to see how people from a different culture live and enjoy themselves together, which is what travel's all about! Naadam festival Mongolia: The opening ceremony at the Ulan Bator nadaam, with a parade through the streets. Where's the best place to see the Mogolian Naadam Festival? Mongolian naadam festivals are like just about any other sports meet or festival: you can either go with the glitz, glammer, and crowds of the cities and see a higher quality show, or you can go with the more relaxed, intimate and amateurish naadam in the countryside. Ideally, you can see both. The Mongolian naadam festival in Ulan Bator involves a much higher standard of competitors and cultural displays, but you won't be able to get very close to the action. There are also a number of free displays in the town square in the days leading up to the naadam. 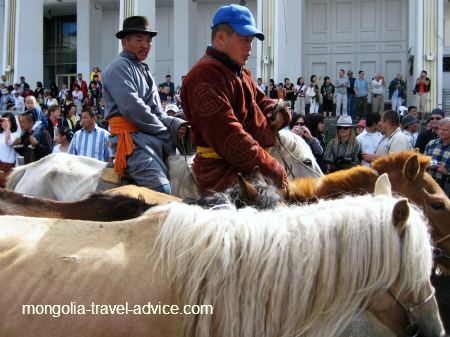 Crowds are big and tickets sell out fast, so you should make arrangements before you arrive in Mongolia. The countryside nadaam are also fantastic; better, in my opinion. Any aimag capital, or local town of any note, will have some kind of naadam. The dancers aren't as good, the wrestlers aren't as big, and the horses aren't as fast compared against the city. However, the scenery is great, you can get MUCH closer to the action, and it just feels... nicer. There aren't half as many other tourists, either, because all of them are in Ulan Bator! Try to catch both, if you can. What are the Naadam festival dates 2012? 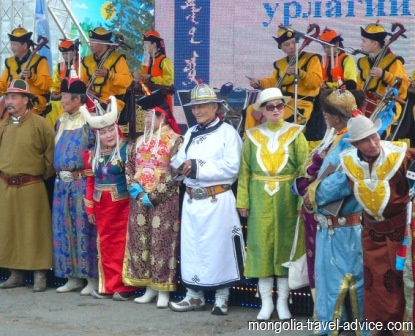 Well, they don't have foreign tourists in mind when they decide to publish the Mongolian nadaam festival dates only a month before the actual event, so you won't know until June. As a guide, the UB naadam festval is usually in the second week of the month, around the 10 July or so. There are only a couple of countryside naadam before that, but after the UB naadam right up until the end of July there are countryside naadam everywhere. 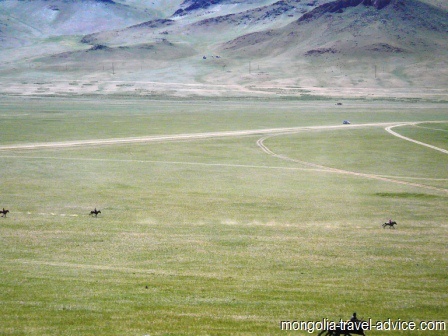 So it's a safe bet that if you're going on a tour in mid-July, there will be a countryside naadam on somewhere during your tour, and you'll be able to see one. Note that July is the busiest time with tourists, so if you want to have Mongolia to yourself you should come in June. 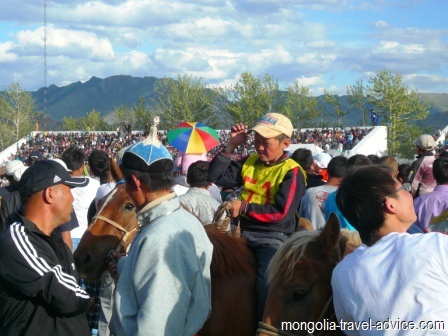 How can I go to the Mongolian Naadam festival? First thing is to read about getting to Mongolia, and plan to do it in around 10 July. Countryside nadaam are pretty easy to join, just figure out which of the Mongolian places you'd like to visit, and you can catch a naadam somewhere in the area if you're reasonably flexible. If you want to get tickets to events in UB, it's best to go secure them beforehand with a tour company like Khovd, who can sell Naadam tickets and offer a guide to help tell you the inns and outs of what's transpiring. 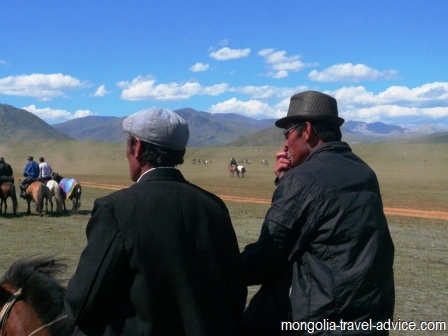 They have a couple of set itinerary trips to see countryside nadaam in places like the gobi desert and beautiful central Mongolia, or can design a custom trip just for you. Use the form below to contact them, tell them what you want to see, and they'll provide a quote and suggested itinerary.